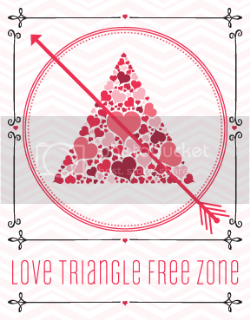 This post is brought to you by Love Is Not A Triangle, a blog for readers who don’t like love triangles. I had the chance to think closely on what I said about the love triangle trope in last month’s book review round-up, and why I’ve been tolerant about them in the past. Yes, it does seem like the ultimate fantasy – falling deeply in love with two undeniably desirable guys at the same time – and yes, I’ve let it pass without comment when it came to writer friends who have used the same trope. I’ll also admit that they work well (to a point) in young adult fiction because of the push-pull that comes with discovering your first love. But what about books that are written for adults, with adult characters going back-and-forth between two characters just because loving them seemed like such a great idea? That’s where my intense hatred comes in. Here’s the deal: For the longest time, my motto in life was “If you want to learn how to love, you’ve got to learn how to fight.” I learned this the hard way by watching my parents go through challenging times in their marriage. I’ve never met a happily committed couple who hasn’t had door-slamming fights during the course of their relationship. Some of them deal with it by accepting those moments as a part of life, and some, like my sister, view these moments as a reminder that relationships are fragile things that can’t be taken for granted. I’m not saying that couples should pick fights with each other more often – abusive relationships are never romantic, and nothing annoys me more than the couple who argues in public – but I do believe that you don’t have to be in love with the person all the time to show them that you love them. That’s what makes relationships so hard: you have to keep asking yourself, every day, why you stay and fight. This view of relationships – of love, and commitment – has colored the way I view the world as both a reader and a writer. It also illustrates the biggest problem I have with most love triangles: they don’t always give the heroine enough credit to pick and choose her own battles. I wouldn’t go as far as to call them misogynistic, but most of the triangles I’ve encountered in my reading do make ninnies out of otherwise intelligent heroines who Just Can’t Choose because They’re Both So Equally Dreamy. Well, if they’re both so great, and you’re not into threesomes, then what on earth are you getting from stringing them along? Come to think of it, why is it important to have a man in your life in the first place? As I mentioned in my previous entry, it’s a lose-lose situation, because no matter what the author does, someone’s always bound to get hurt. Seriously, authors, what is stopping you from calling the end game for just ONE true love? Are you being pressured by your editors and publishers telling you that you can’t sell a book unless you get your readers to divide themselves into “#teams” who “ship” your characters? * Are you so enamored of your two male characters that you have to crowd-source your readers to “vote” for their favorites? Because if that’s the case, then I’m sorry, but you’re cheapening your story, and you’ve just short-changed that wonderful writer’s voice that have earned you so many reads in the first place. And if you can’t trust your own voice, then how am I supposed to trust you? Just this once, I’d like to read a book or a series about a heroine who picks her own hero, and chooses him time and again, without a third wheel to keep things spicy. Just this once, I’d like to read about a couple who gets tested, not by jealousy, but by priorities and communications and, you know, life. Just this once, I’d like to read about true love, from a couple who chooses to stay and fight together. Is that too much to ask, book world?